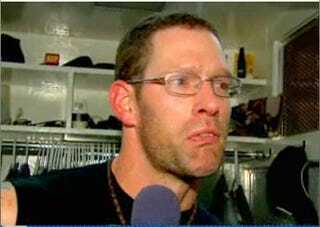 Much like his reliever brethren Todd Jones, former Yankee Kyle Farnsworth took the news that he was traded to Detroit for Pudge Rodriguez yesterday with the stoicism of a Navy Seal. He realizes the business of professional baseball doesn't allow for emotional attachments and that success in this game requires one to compartmentalize overwhelming feelings of loss and present yourself in a public setting (especially with reporter's ramming tape recorders in your grill and the camera lights blinding you) with dignity and honor. Or not. As difficult as Farnsworth's 2 1/2 seasons in New York have been, the 32-year-old reliever emerged from the meeting with his eyes glassy and his lower lip trembling. He briefly broke down in tears while discussing the trade with reporters, saying, "I had a good time here, so it's tough." Hugs, Kyle. Your camo underwear and gun collection will be missed in the Bronx. The Yankees shed themselves of their inconsistent reliever in favor of yet another former MVP in Rodriguez, who will be a major upgrade at the position in both leadership and performance. Also? Pudge is not much of a weeper. Trade deadline today, kids. So we'll probably see more of these outbursts throughout the day.